After 28 years, we finally have a train to the airport. In a city where the economy is largely based on tourism, it took nearly three decades to quickly connect visitors to downtown, our financial district, and our popular southern suburbs. And while the new Orange Line train is a long-awaited godsend for many in the area, using it is not so simple as boarding at the baggage claim. There are some things you should know about our new airport service before planning your trip. The new Orange Line begins at Dadeland South station in Southwest Miami-Dade County near Dadeland Mall, just south of Kendall Drive. It stops at all the Green Line stations – through Coral Gables, Coconut Grove, Brickell and Downtown – until it gets to Earlington Heights. 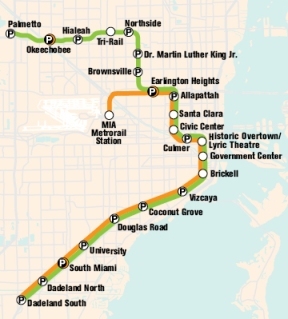 Earlington Heights is just northwest of downtown Miami, and is the stop where the Orange Line spurs off to Miami International Airport. There are no stops between Earlington Heights and MIA. The Metrorail drops you off at the new, shining Miami Intermodal Center (MIC), and from there you must take a small tram called the MIA Mover to the actual airport terminal. If you are arriving at MIA, just follow the signs to the MIA Mover on Level 3, and board from there. The most important thing for a visitor to know about the new Orange Line? IT DOES NOT GO TO SOUTH BEACH. That’s right. In our city’s infinite wisdom we never extended the Metrorail to our most popular local destination. So while the new line makes it much easier to get downtown, it will get you no closer to your Miami Beach hotel than it did in 1984. You can take the Orange line to Government Center station, and try and take a bus from there to South Beach. But at that point it will make more sense for you to take the Airport Flyer bus, which makes only one stop between the airport and South Beach. The Airport Flyer is available on the ground level, across traffic from baggage claim. If you are traveling here for business, or are staying in the downtown area, the Orange Line will take you there quickly. Just transfer to the Metromover at Government Center and it will take you to wherever your downtown destination is. Same if you are traveling to Coral Gables or Coconut Grove. You can take the train there and either take a short cab ride or bus to your destination. Or have your friends pick you up at the Metrorail station, much closer than the trek to MIA. 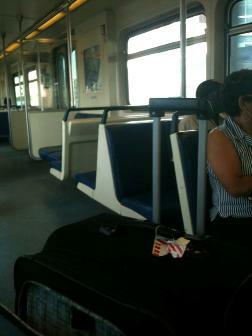 The Tri-Rail is a little bit trickier. 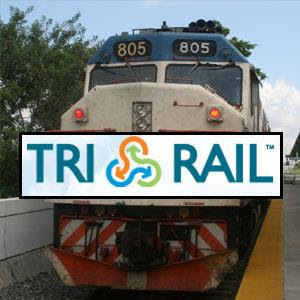 As of right now, the Tri-Rail, our tri-county train service that goes to Broward and Palm Beach, does not go directly to MIA. Currently, its “Miami Airport” station is actually in Hialeah, and requires a bus transfer. You CAN transfer from the Tri-Rail to the Metrorail in Norwest Dade County, then take the Green Line south to Earlington Heights and transfer to the airport train there. But the transfers are not necessarily immediate and the Tri-Rail transfer station is not in the best neighborhood. If you are planning on taking the Tri-Rail from points north to MIA, it is probably best to wait until the Tri-Rail opens it station at the MIC, currently scheduled for late 2013. Similarly if you are trying to get from Ft. Lauderdale-Hollywood International Airport (FLL) to MIA, Tri-Rail is not really a practical option. While the map may state both airports have stations, both airports require lengthy bus transfers to get to those stations. Making your door to door trip longer than you may have anticipated. So unless your time between flights is so long you have time for a local-transit adventure, a taxi or private transportation company is still your best option. Airport shuttles will not take you from FLL to MIA. While many are excited about Metrorail’s new service to Miami International Airport, familiarize yourself before depending on it for your trip. If you are staying in Miami on the mainland, it will be the quickest, easiest way for you to get where you’re going. But if you are coming to South Beach or Ft . Lauderdale, you’ll need to find other options. We’re making progress here, but nothing in Miami is perfect overnight.